This morning, I found a great deal on a delay. It’s the BBE Two Timer Dual Mode Analog Delay pedal. The BBE Two Timer lists at $209.00, and is usually available for $150, but is on sale for $111.07 at Amazon. $39 off what you normally see it for… is a good deal for sure. This pedal also ships with FREE super saver shipping. 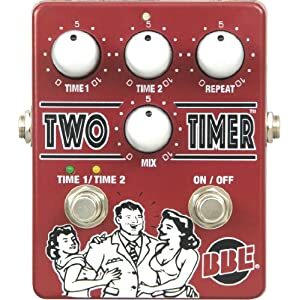 Again, the BBE Two Timer Delay is on sale for only $111.07 at Amazon.